If you’re looking for good vehicles that have high combined mileage ratings from the EPA, we have the rundown. While there has been a trend in the automaker industry toward alternative fuels in recent years, let's be honest. The vast majority of Americans still purchase vehicles with gasoline engines. Hybrid, plug-in hybrid, and fully electric (EV) vehicles only accounted for a combined 3% of all U.S. car sales in 2017! If you are interested in high-performing hybrids, however, read our comparison of hybrids, plug-ins, and EVs. Whether you’re a commuter or just looking for some savings, these are the five most fuel-efficient vehicles that feature conventional gasoline engines. 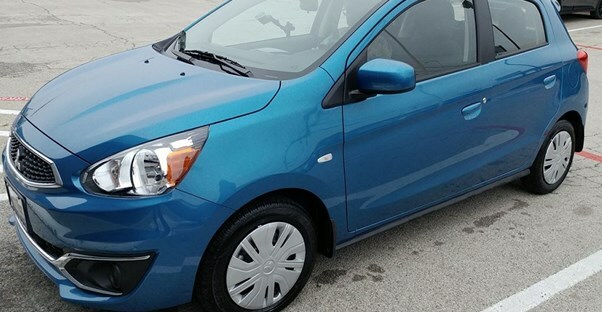 Like all of the vehicles on this list, the Mitsubishi Mirage is a very small car. The subcompact has outstanding fuel economy ratings of 37 mpg in the city and 43 on the highway. That's the best performance of any car sold in the U.S. that doesn't utilize an alternative fuel source or battery of any kind. The 2018 Mirage not only saves you money at the fuel pump, but it also saves you money up front. It's starting MSRP of $13,395 is one of the cheapest price points of any car on this list. Honda ties itself for second place when it comes to EPA combined fuel economy ratings. At 36 mpg, the 2018 Honda Fit and the larger 2018 Honda Civic are great buys. The Fit has a starting MSRP of $16,190. Even though it may be a subcompact vehicle, it has the interior volume of larger, more expensive family movers. What makes it truly special is the backseat, styled by Honda as a "Magic Seat." It has a 60/40 split so it's not an all-or-nothing decision to put the seat down. When it does fold down, a flat floor is created which is especially helpful for loading long items. If you have something tall you need to squeeze inside, the rear seat bottoms flip up, offering uninhibited space from the car floor to the roof. Plus, even the entry-level LX trim has a multi-angle rearview camera! The other Honda vehicle that achieves 36 mpg combined is the 2018 Honda Civic. Like it's smaller Fit cousin, the base trim also features a multi-angle rearview camera, but it also has a standard manual transmission. You'll want to upgrade to the automatic if you want the highest fuel economy ratings possible. Still, with a base MSRP of $18,940, that's more than affordable. After a major update in 2017, the 2018 model doesn't change much—and that's a good thing! Still around is the sporty and aggressive styling that it inherited last year. This isn't your average-looking compact model. The Civic also has the sporty driving dynamics of more expensive vehicles, all while maintaining class-leading fuel economy. In a two-way tie for third are the 2018 Hyundai Elantra and the 2018 Toyota Yaris iA. Like the Civic, the Elantra underwent a major overhaul for the 2017 model year. In 2018, it remains mostly unchanged. Gone are the "fluidic sculpture" design cues of the previous design language. It was aggressive, though somewhat polarizing. Instead, the refreshed look is stately and sophisticated. If a little bland, it definitely has mass appeal and is inoffensive to any taste. Though its starting MSRP is $16,950, the Elantra comes packed with features. Even at the next trim level up, only $18,850, drivers will get blind spot detection with rear cross traffic alert, lane change assist, and rearview camera with dynamic guidelines. Affordability with features galore is the name of Hyundai's game. The 2018 Toyota Yaris iA is a tricky beast to explain. Once upon a time, Mazada sold the Mazda2 in the U.S., but when they pulled the plug on sales the car was rebadged and sold as the Scion iA (Mazda signed a "long-term partnership" with Toyota in 2015). Now that the Toyota has shuttered the Scion marque, it transitioned some of the remaining models to wear the Toyota nameplate. So 2018 will be the last year of the Mazda-made Yaris iA before a complete Toyota re-design in 2019. Thanks to the Maza tuning, the Yaris iA posses tight handling and quick responsiveness all without wasting any gas. The only downside is that it's not as feature-laden as other competing vehicles. Which 2018 Toyota Camry Is Right For You? Which 2018 Hyundai Elantra Is Right for You?